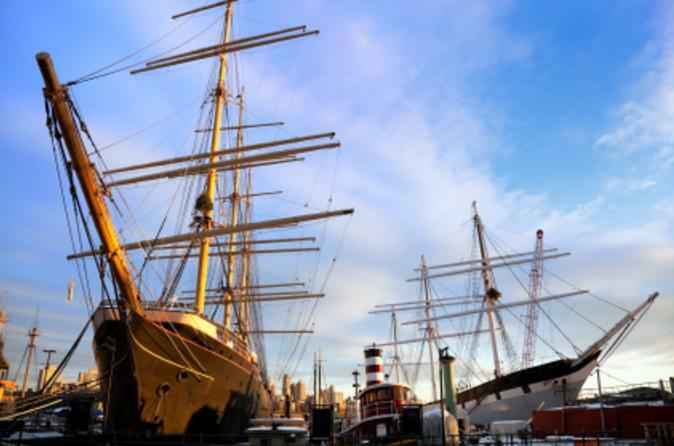 Uncover the historic South Street Seaport district and hear gripping tales of the port's turbulent past on this historical walking tour of New York City. You will explore this seaside neighborhood, which blends the early days of sailing intrigue with the vibrant shopping and dining of present. Your knowledgable guide will show you sights and perspectives rarely seen by locals, as well as the hottest places to shop, socialize and soak up the Seaport scene! This New York City walking tour takes you through the South Street Seaport district and its origin of commerce, which includes the once-famed Fulton Fish Market and a 150-year-old working print shop to a now bustling mecca for shopping and dining. The South Street Seaport was a major port for New York between the American Revolution and on through the Civil War, and became a home to numerous moored historical sailing ships, including the Wavertree. You'll have magnificent views of the Brooklyn Bridge while you see places like the Bridge Café, New York's oldest drinking establishment, and the Paris Café, where Thomas Edison planned lower Manhattan's first electrical grid. This area was knows as the gateway to the world, with it's bars and taverns, shops, ships, houses and old streets. Following the haunted Bridge Café, you will see Jeremy's Ale House, where 9/11 first responders took refuge, and the Titanic Lighthouse, a memorial that was dedicated to those lost their lives when the ship sank and also the origin of New York’s famous New Years Eve Ball Drop! Among the landmarks in this five-block radius, you will also see the site of George Washington's first presidential mansion, the Federalist buildings from the late 1700s, and the 1830s Greek Revival warehouses and counting quarters.